I’ve waited 50 years to meet Che Guevara. It doesn't take long: Che's image greets us shortly after arrival at the José Martí International Airport in Havana. The first thing we see in Cuba’s capital are the taxis: a line of pristine pre-‘60s American cars –- Chevys, Oldsmobiles, Buicks . . . But then, looming beyond the parking lot, is a billboard with that famous image of Che: black beret with its single star, a guerrilla’s beard and scruffy hair, confident stare into the future. “We see you every day. . . Che Comandante, amigo,” the billboard says in Spanish. What? Is he still alive? Che’s portrait is all over Cuba: on billboards, banners, posters, books, t-shirts, even an eight-story-high iron sculpture on a high rise overlooking Havana’s massive Plaza de la Revolución. 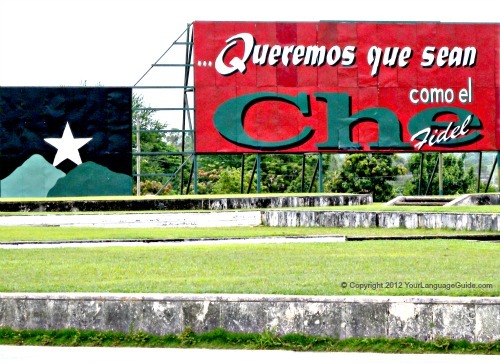 But Che is most evident in Santa Clara, 170 miles east of Havana. We visit the park-like complex with its 22-foot-high bronze sculpture of Che. Fronting the monument is another of those huge billboards, this one a tribute from Fidel Castro, "We want to be like him (Che)." Che's ashes are entombed in his mausoleum here; his life celebrated in a small, but attractive museum. We look for the gift shop, for some small memento of our trip here. The search is in vain; this is sacred ground –- no commercialism permitted.